The secret is out and the 2017 Red Paddle Co range has arrived! With a number of new features and innovative designs introduced such as: the new FFC system; re-designed Titan pump; LeverLock handles; FCS fins, redeveloped bag; MSL Fusion and RAM Mounts on every board. Their trusty hard-working team have once again, delivered industry-leading products which continue to make them the World’s leading inflatable SUP brand! Despite an accumulation of factors contributing to this grand title, Red Paddle Co believe one of the key influencers for this are the endless hours spent on innovation. From enabling you to film your paddle board journey on your Go Pro via your RAM Mount fitting to introducing a foil liner inside their board bags to protect against extreme temperature conditions, just goes to prove that they are constantly on the look out for new ideas to make the best products possible. New for 2017 on the Elite Race boards Red Paddle Co have introduced Forward Flex Control (FFC), yet another patented innovation. FFC is an enhanced system to stiffen the front section of the board to remove any flex created in sprinting phases of a race. This not only increases board speed to give you a competitive edge, but the system also works alongside the Rocker Stiffening System (RSS) to deliver a more rigid ride. Now for those of you eager to take those impressive paddling shots to make your mates jealous! This year, Red Paddle Co have teamed up with RAM Mounts, the world-leading accessory bracket manufacturer. From paddling to the beat of your waterproof speakers to taking incredible images of your paddling REDventures, the RAM Mount bracket enables you to experience paddling in a far more enhanced enjoyable way! On the ‘flipside’, Red Paddle Co have also teamed up with FCS. Any of you who have surfed before will know that FCS is the world-leading surfboard fin creators. 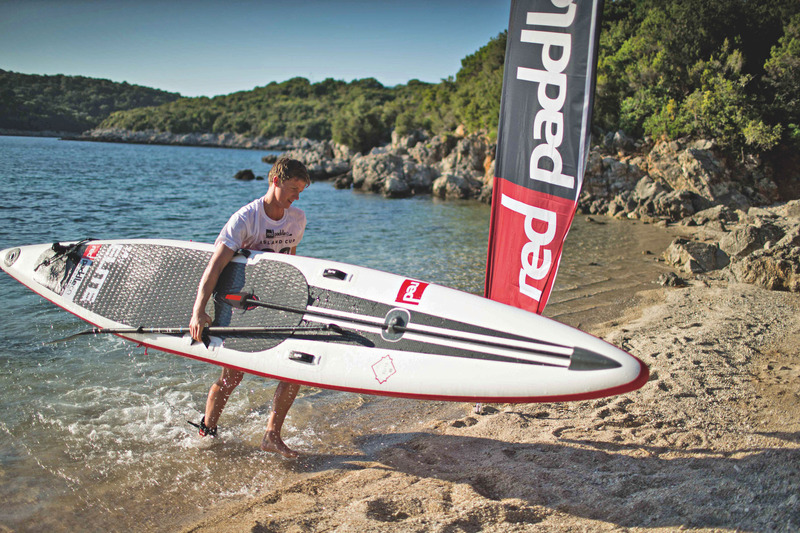 Now Red Paddle Co’s Explorer, Sport and Whip boards all feature FCS Connect Fins that simply slot in by hand, taking mere seconds to fit. With a specially designed wear-resistant barrel and corrosion-resistant titanium pin mechanism incorporated in the base, the fin is extremely durable and resistant to any potential damage. The often-copied rucksack has also had a bit of a revamp. To the eye, the board bag still maintains the same look as previous years, however the real change lies in the interior of the bag. Now, with an added foil liner, you can feel safe in knowing your board will be protected in all conditions, whether it be sweltering heat or ice cold temperatures.The company’s innovation continues into their paddles, with LeverLock added to five of their 2017 paddles. LeverLock’s patented technology allows you to make adjustments on the paddle’s shaft using one hand, allowing maximum flexibility and minimum fuss. Win win! Red Paddle Co also are the only brand to use MSL Fusion® (which stands for Monocoque Structural Laminate) on all of their boards. The revolutionary material which fuses the second layer of hard wearing polymer at the fibre level to the dropstitch core at the raw material stage. MSL® reduces hand-gluing errors and the amount of glue used in each board saving up to 2kg in weight resulting in boards which are stiffer, lighter and stronger than ever. The tried and tested, patented Rocker Stiffening System or in simpler terms, RSS adds up to 40% stiffness compared to rival boards, RSS works by slotting 2 stiffening battens into pockets that are individually laminated onto the side of the board. Whilst still maintaining the same manoeuvrability, RSS battens come with cords to make them easy to remove and held in place by a new special Velcro tab. Equipped with every board, you will find Red Paddle Co’s Titan Pump. Created by their expert engineers, the pump features a dual-chamber system and hi-flo handle that pumps air into your board at a ferocious 60mph. This not only means, the board inflates to 15-20psi quicker, but you will also be using far less energy, so you can spend less time pumping and more time paddling.